VOORHEESVILLE – The Blackbirds got off to a 2-0 start after beating Taconic Hills 13-0 at home on Saturday, Sept. 9. All 13 points came in the third quarter, the first score on a 55-yard pass from quarterback Ian Owens to Vinnie Patterson. Then, with Taconic Hills (0-2) facing a third and long from the Voorheesville 25, Jake Palmer broke through to force the Taconic Hills quarterback to technically fumble, but it was more of a backhanded pass as he was getting dragged to the ground. The ball was picked out of the air by defensive lineman Jimmy Gravino, who scampered in for a touchdown. Palmer was also the team’s workhorse of a punishing running back on offense. 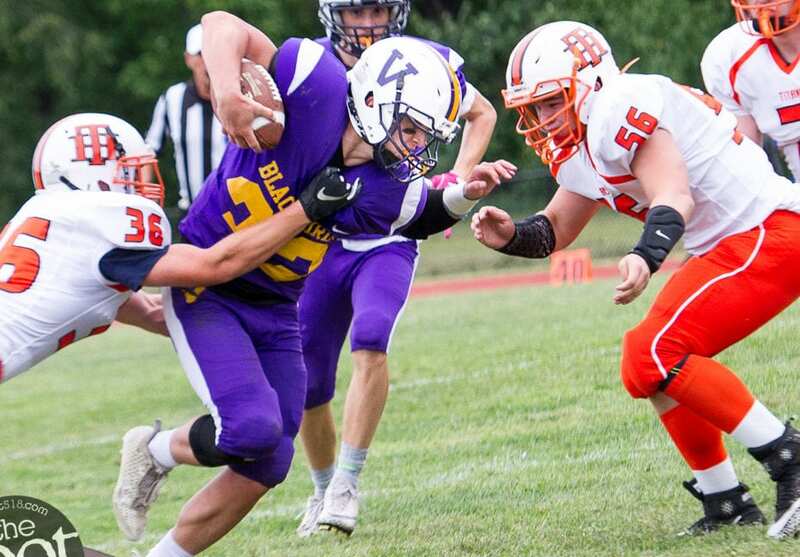 Voorheesville will host Chatham (2-0, 2-0) on Saturday, Sept. 15, and Taconic Hills (0-2) will host Watervliet (0-1, 1-1) on Friday, Sept. 14.